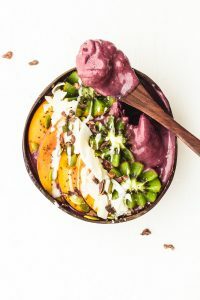 A delicious breakfast meal – homemade peach acai bowl with coconut butter drizzle on top. 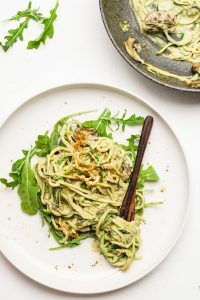 Raw vegan | oil free | gluten free. 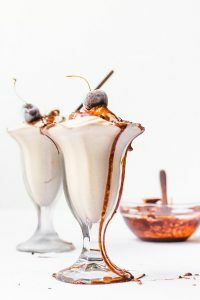 A delicious Hot Fudge Vanilla Ice Cream Sundae recipe that is healthy and sooo tasty. Oil free, refined sugar free, gluten free. Two options: ice cream maker, and no churn option. 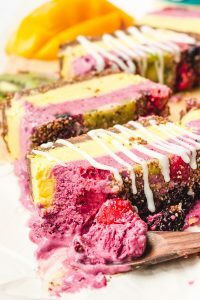 A tasty raw vegan berry and mango frozen fruit cake that tastes like cheesecake and ice cream put together. Perfect for summer. Refined sugar free, oil free, and gluten free. 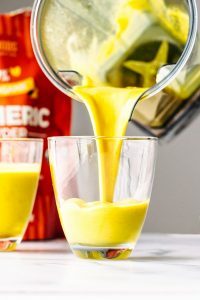 A tasty and silky smooth vegan iced golden milk latte made with turmeric! A perfect, and nutritious, treat for any hot summer day. Refined sugar free.